Welcome to the Blog of Onstream-Guide. Here you will find an informative fly fishing feature updated every month or so. Well except this one...I'm getting married in December to this girl, so this will be around just a little longer. But a good winter fly fishing blog will be on its way. At some stage in our fly fishing careers many of us have peered into the lurky world of entamology- or the bugs that trout and grayling eat in rivers. The nymph or larval form of these live under rocks and stones in the stream. The artificial nymphs we tie on the end of our tippet are supposed to represent these. And that's the point of this particular blog. Our artificial nymphs don't look much like the collection of small smudges that the average kick sample produces. Artificial nymphs are generally much larger and/or the wrong shape and colour. The natural bugs when viewed are far from still. Not only do they wriggle and contort their shape but tiny cilia (hairs) beat continuously. In fact our imitations are generally a long way off the mark in terms of imitating the size and shape and often the inherant movement of natural beasts and bugs found in the river. So why do trout and grayling take our artificial flies? Well trout and grayling are both opportunistic sight feeding predators but not entamologists. They really don't care what their food looks like. They only care that it is alive and edible. This is the only important factor as far as the trout and it's survival is concerned. For example on the beautiful river Tees an invasion is underway. Non native signal crayfish are now found throughout. The trout before the invasion had probably never even seen a signal crayfish. But they eat them now for sure and appear to grow big on them. I find that orange headed tungsten bead flies fish particularly well and I'm sure they take them as the orange claw of a juvenile crayfish claw. Far from imitation but highly suggestive of something with life. Red/orange is of course the colour of blood. A colour associated with a predator like a trout and its prey. Think about the flaring red gills of an escaping baitfish. And in peaty coloured waters it has been handed down wisdom that red/orange in a fly will add apeal. And for grayling especially so. The obvious traditional pattern is the red tag! However in itself this observation partly explains why our nymphs, outrageously oversized as they are will still fool fish. The trouts menu is more catholic and extends well beyond stream bugs. It will eat other small fish, terrestrial insects, rats and mice in certain areas. In fact anything that is alive. Size? As long as it is smaller than the trout, it doesn't really matter. We tend to forget the trout is a predator when we fish for him. He does not decide in his mind this is not a large nymph I am eating but a minnow or visa versa. As long as we can present the fly well with stealth the pattern and size can be irrelevant. This season I fished with a good friend the secretary Of Derwent Angling Association, Ian Colbourne. Ian is a highly skilled fisher. He fished a duo (nymph suspended under a dry fly) through some great spots but was struggling.I handed him a streamer. He looked puzzled. Well his superb size 16 and 14 nymphs had failed and the fish were skittish. So why would a streamer work? I insisted he try it. He was almost instantly into a good fish only his second of the day and added more quickly. Fish are not capable of rational thought. A bigger fly grabbed the attention of fish. Energetically it makes sense to the fish by selecting larger calorie meals he would stand a better chance of survival. Natural selection in action. I also have another friend who is a superb fly lure fisherman (amongst others) in a river and he is highly regarded in the competitive scene. Fred Bainbridge. His fly looks like nothing in God's rivers. It doesn't have to. It looks alive and that is more than enough. This has been recently reported as the imitation versus presentation debate. Does a fish take your fly because he was fooled into believing it was a large dark olive nymph? Or you got the fly in the right place and the right time and the fish was fooled into believing it was edible. You will guess that from the above I'm firmly in the presentation camp. 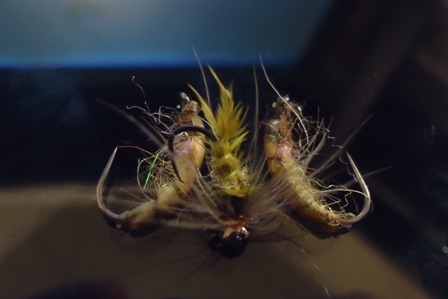 In a hatch I find spider or soft hackles for those Stateside as effective as any specific imitation. The soft hackles providing one of the most often overlooked elements of imitation...inherant movement. Those gills and cilia of the unimpressive kick sample smidges. I'll use an example of a czech nymph. Here is a picture of one tied by my friend Jan Siman. A genuine Czech nymph from a former world team champion!! It's as good an imitation of larval forms of caddis larvae as you will see. It is a correctish shape and colour and only bigger than about 70% of the naturals. Some do go this big. It is a beautifully produced realistic fly pattern. It will catch fish. And below is my own bead headed pattern which represents exactly the same thing. 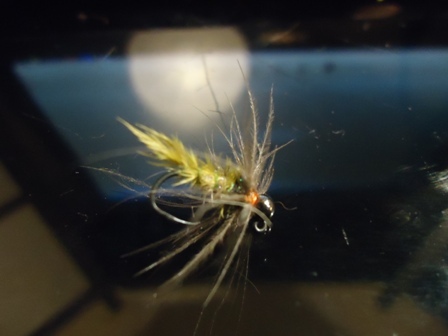 But my fly is the one that will go on the nymphing rig although it is technically inferior to Jan's in terms of tying. And to our eye it might not at first look to be as solid an imitation. It is tied with very soft and motile materials including a CDC hackle. In the water with added movement those hairs on the body come alive. Those CDC hackles also give the impression of movement. And movement to the fish suggests life. It might be a poorer "exact" immitation of a caddis larvae than Jans excellent Czech nymph, but it imitates the impression of life far better. It is a better catching fly based on my experience. To this end many of my nymphs are tied with enhanced movement in mind and they appear to work. Many thanks to you all and for the comments on our You Tube channel. Next blog will be on bonefish fly fishing in Cuba (honeymoon in December) or of winter fly fishing in rivers. Regards, Jon and Nellie at Onstream-Guide.